The other day, I decided to get some supplies from an online Japanese supermarket. I was wanting to buy some purple sweet potato Kit Kats. You see, I’d been craving purple yam desserts for years because England doesn’t believe in yam, and I thought this Kit Kat could be close enough to do the job. So, I ordered two of those, alongside £75 worth of Japanese groceries to qualify for free shipping. I also found my favourite peanuts in the world (Kasugai cuttlefish peanuts) in the same shop so I was over the moon. WOAH. Could they get any bigger?? I guess I should have known better. The product does say “Mini”. And I had actually bought green tea Kit Kat Minis about five years ago. Still, that was five years ago. I have a bad memory and all the Kit Kats I’ve eaten since have been normal people-sized ones. Also, the price of the mini Kit Kat is more than 10 times the price of a normal Kit Kat. So you could perhaps excuse my mind for thinking I would get something a tad bigger. They were very tasty but did not satisfy my yam craving because they are kind of different. Then, there was the matcha. I’d never bought matcha before so I chose this one based on the fact that the packaging is very pretty and it’s the most expensive one in the shop. Well, here’s my pretty matcha. I had expected it to be maybe three or four times bigger?? Yes, the weight is listed on the product page but who can tell off the top of their heads how much physical space 20 grams of powder takes up? More importantly, I tend to ignore measurements when online shopping. Who has time to scrutinise everything? Okay, I just did a Google search and my matcha doesn’t seem very expensive anymore. 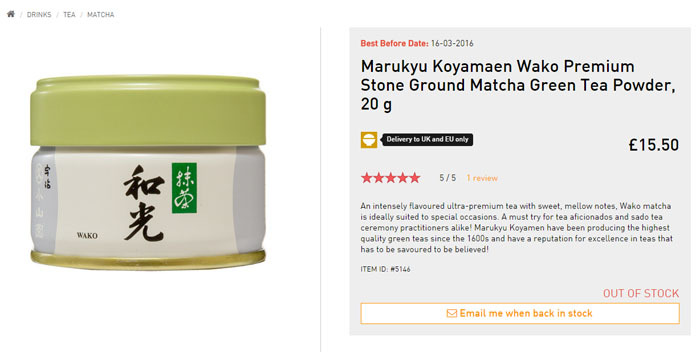 From what I can tell, matcha prices range from £1 to £20 per 10 grams. But it was still rather shocking. 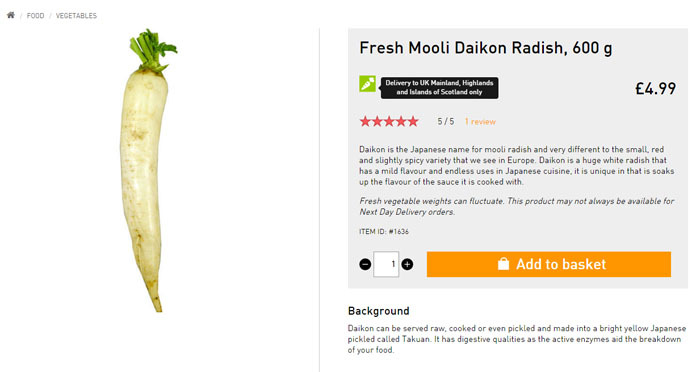 The great Daikon radish, otherwise known as mooli in England. It’s so very tasty in stews and soups because it soaks up all the wonderful flavour and explodes-melts in your mouth (but you have to cook it long enough). Now, I’ve never bought one in Singapore (I didn’t cook back then) and UK supermarkets generally don’t stock it. So my only experience with it has been eating the final product all diced up and cooked. I had accidentally found it for sale in Ocado last year, but only managed to buy two before it was gone from the virtual shelves. I’m not sure if it’s because no one buys it or because it went out of season. After it disappeared, I would check every so often while doing my weekly grocery shop, but it never came back. So, anyway, I bought this Japanese mooli even though it cost £4.99. I thought it was really expensive, expecting it to be the size of the one from Ocado (about twice the size of an average carrot), which had cost £0.70. I bought it anyway, visions of exquisite braised beef with Daikon radish soaking in savoury sauce filling my head. And, of course, the Daikon radish turned out to be gigantic. I photographed it with an average-sized carrot to offer some scale. What in the world was I going to do with a giant vegetable? Much as I love it, I didn’t really want to be eating it every day for a week. Yes, I should probably have been clued in by the weight listed on the product page. But again, who goes around knowing what a carrot weighs? Anyway, we managed to finish it in three weeks. It kept surprisingly well in the fridge even with bits chopped off it, so that was a good ending. Well, as you can tell from reading this post, I haven’t got time for anything most of the time, so gotta go, no time to waste! Until next time!